The picture is a from a painting by San Diego artist Deb Bramson, who paints in a wide variety of styles and a wide range of subjects. A couple months ago I was looking for "people paintings" as I wanted to confront the sensitive problem of cutting portraits into pieces and found this image. Deb has painted cocktail scenes, down and outers, European outdoor scenery, still life (she likes Puzzle 26 Blue Bottle, Venice, Italy). Many of Deb's paintings have an "in your face" attitude - something which adds more variety to the works I offer. Deb's title for her painting is "A Tribute to Jesse Helms". Deb also makes ceramics. 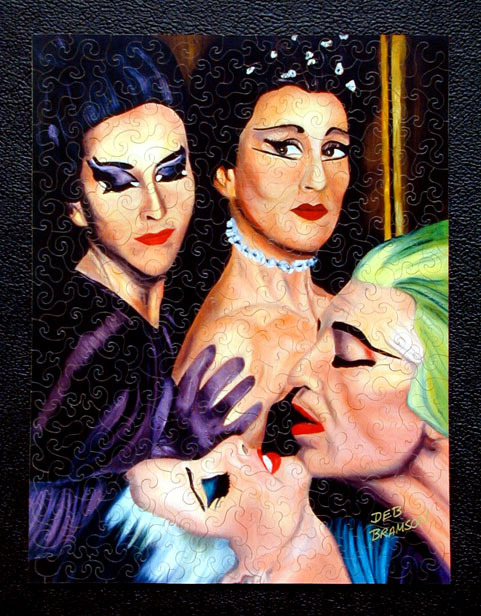 On September 22, 2000 I displayed this puzzle at an opening for two other artists and met Deb's husband, Jim, who among other things is a psychologist who does corporate team building work. I discussed my recent puzzles for Lucent Technologies and shortly afterwards he ordered a trial puzzle for his team building work. I took this nice turn of events as a signal to relax and share Deb's interesting picture. Deb has a good artist sense - if she hadn't added the two vertical yellowish strips in the upper right, the painting would have had a completely different feel - unbalanced - and would not have ended up as a puzzle! The dark areas in this puzzle highlight my Swirl Curl style well - the puzzle is virtually flawless. One thing this puzzle does is introduce a very subtle extension in the Swirl Curl style, some of the swirls get a little fatter in the middle of the swirl. I call these Sway Curls.